Moist, delicious, and flavorful these potato skins are crispy on the outside and tender on the inside. A perfect combination! Potato skins don't have to be unhealthy to taste good. In a small bowl combine olive oil, garlic powder, and onion powder. Wash potatoes, scrubbing well. Dry and prick potatoes, then coat with the olive oil, garlic, and onion, powder mixture. 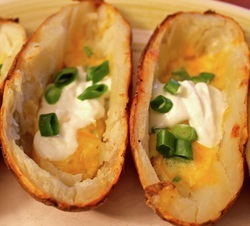 Wrap each potato with foil, bake for 45 minutes. Remove foil from potatoes, increase oven temperature to 500 degrees. Bake potatoes for 15 minutes or until potatoes are soft. Remove potatoes from oven and let cool. Brush inside of potato with the remainder of the oil and garlic mixture. Bake at 475 degrees for 6 minutes, turn over and bake 6 more minutes. Remove from oven. Top with bell pepper then cheddar cheese. Bake 6 minutes or until cheese is melted. Remove from oven, top each half with 1/2 tablespoon sour cream (or yogurt) and 1/4 teaspoon green onions.